Prince of Wales was a King George V-class battleship of the Royal Navy. She was originally named King Edward VIII but upon the abdication of Edward VIII the ship was renamed even before she had been laid down. This occurred on New Year's Day 1937 at Cammel Lairds at their Birkenhead shipyard, and hull took just over two years to build. She was launched on 4 May 1939 by the Princess Royal and she was fitting out when war was declared in September. 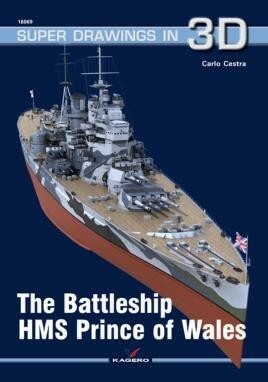 … this is the ideal reference for those seeking to build HMS Prince of Wales in late 1941. If you need reference for this vessel or indeed wish to scratch the vessel this is the book to seek out for the task.